In today’s technology-driven market, it is important to understand the materials being specified and used in electrical and electronic equipment applications. The cost of failure is incredibly high in terms of safety, not to mention the cost in terms of downtime, productivity, and actual direct cost. The evaluation and testing of materials must start with a reliable understanding of a material’s construction and properties. But how do we know what a material is if a distributor uses their own “brand name”. How do you know what a distributor is actually selling? Branding another company’s material is not a new practice. Distributors and fabricators play an important role in the market often developing new applications for materials. It is only logical to want to protect one’s own innovation. This paper reviews an example of the confusion caused by poor material data. By using property names that have little meaning and by failing to provide industry accepted test methods for those property names, the resulting confusion leads to potential material selection errors. It is important to define test properties and understand the applicable test methods for material selection. We fabricate custom electrical insulating components for power systems equipment including generators, transformers, switchgear, power supplies, electric motors, and related equipment. Insulation material selection can be quite a challenge due to the number of factors that influence insulation system engineering and insulation component design. Many engineers rely on material data sheets provided by their vendors. However, many distributors create their own material data sheets instead of using those provided by the material manufacturer. Also, many distributors use their own brand names for material manufactured by another company. In these cases, it can be hard to understand exactly what is being supplied. It can also be hard to rely on the test data provided if it is incomplete. For example, what is Grade PCGP-HT? The following information will illustrate exactly how confusing this misinformation can be for an engineer when selecting materials. PCGP-HT is a distributor branded product. According to the distributor, it is a “heat resistant laminate made from a fiberglass cloth saturated with a high-temperature phenolic resin.” The data sheet claims that the material has heat resistance of 600 °F (313 °C) short-term and 450 °F (232 °C) continuous. Frankly, no glass phenolic laminate manufacturer on the planet claims to have a 232 °C relative temperature index (RTI) to our knowledge. The RTI is an industry accepted standard (UL, IEEE, IEC, NEMA) for determining the thermal performance of a material and is the method used by UL in their yellow card program. Unfortunately, there is no industry standard test for “heat resistance” and the data sheet does not indicate a test method for determining this type of heat resistance property. (To learn more, read The Gund Company’s white paper “Thermal Performance of Electrical Insulation Materials”). The concern here is that an engineer may specify or approve this material for an application expecting 450 °F or 232 °C thermal performance and there is no reason to believe that such performance is possible from this material. It is also impossible to know what is meant by the term “heat resistance” in terms of the materials retention of its dielectric or mechanical properties at elevated temperature because there is no test method provided. It is a reality of life that companies can make mistakes in their data sheet information. Datasheets are provided as a helpful tool for an engineer to use when making decisions, but no datasheet is supposed to be used without further testing of the material in application. In this case, despite efforts to have this issue addressed by the distributor, the error continues to potentially mislead whether intentional or not. After addressing the issue with the distributor several times over several years, a few alarmed customers wanted some confirmation of what material was really being supplied as Grade PCGP-HT. Having obtained samples labeled as Grade PCGP-HT from these customers, The Gund Company’s lab conducted analysis on the Grade PCGP-HT and compared it to the Norplex® Grade NP504. 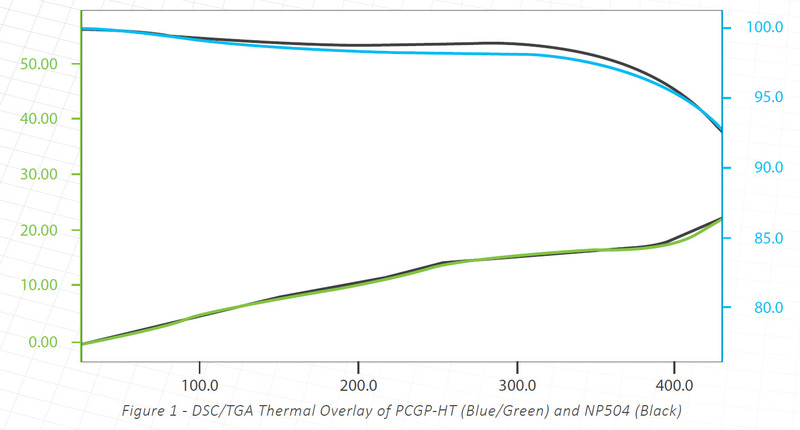 The DSC / TGA thermal analysis shown in Figure 1 below confirms that the two materials are likely identical based on the samples provided by our customers. In other words, for at least some of the orders supplied as Grade PCGP-HT, the material is likely manufactured by Norplex® Micarta as their Grade NP504. Only the distributor could confirm with certainty that Grade PCGP-HT is commonly manufactured by Norplex® as their Grade NP504, but our analysis below shows a signature that is too identical to be a coincidence. The black lines are Grade NP504 and the green / blue lines are Grade PCGP-HT. As you can see, there are no test methods provided for any data property, though some assumptions could be made that ASTM test methods are being used based on the test condition indicated. However, for the heat resistance property, there is no test method indicated. In reality, this property value has no meaning because “heat resistance” is not defined and there is no test method provided. Description: Woven glass fabric with high temperature phenolic resin. Good flexural, compressive, and impact strengths at elevated temperatures. It is capable of continuous operation at 175 °C. NP504 has excellent creep resistance because of the phenolic resin system. 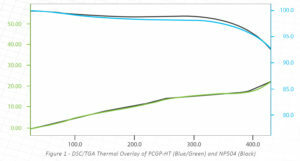 A comparison of the datasheet for Grade PCGP-HT with the data sheet for Norplex® NP504 shows a number of inconsistencies from flexural strength to temperature index. Because many customers have specified Grade PCGP-HT due to its heat resistance of 450 °F or 232 °C, it is important to note that the Grade NP504 has a temperature index of 140 °C electrical and 170 °C mechanical. These temperature index ratings of Grade NP504 are typical for a glass phenolic laminate material as indicated in the NEMA G-3 standard for this material, but they are a far cry from the 232 °C heat resistance value indicated in the Grade PCGP-HT data sheet. Clearly, distributors do not manufacture raw material in most cases. As a manufacturer of electrical insulation materials, The Gund Company has some unique insight into material testing and material performance. Of course, any company can make an innocent mistake on their technical data sheets so we do not mean to be throwing stones. It may be that Grade PCGP-HT has been made by several different manufacturers over the years and the data sheets have never been corrected. Regardless, the heat resistance property does not seem reasonably accurate or plausible by any electrical industry accepted definition. Though no test method is provided by Norplex® either, it is reasonable to assume that the temperature index values refer to the UL 746 test method based on the UL material certification (UL yellow card) for that material. Based on the data sheet values that correspond to the UL yellow card values, Grade NP504 can be expected to maintain more than 50% of its dielectric strength at 140 °C and maintain more than 50% of its flexural strength at 170 °C over a reasonable lifespan (typically 20,000 hours is used). Based on UL standard 746 that references ASTM D2304, it is reasonable to apply the ASTM D2304 statement that “experience has shown that the thermal life is approximately halved for each 10 °C increase in exposure temperature” over the rated temperature index for a given material. Unfortunately, there is still some confusion because the Norplex® Grade NP504 data sheet does indicate that the material has a “continuous operating temperature” of 175 °C, but it gives no explanation of the meaning of that term or the test method on which it is based. So, what’s in a name? What properties does a distributor branded material really have? What do those properties actually mean? What test methods are used to determine those property values? Can those values be used to compare to other materials if there is no standard test method? Because these questions cannot be easily answered, the risk profile for using distributor branded material can rise considerably. At the end of the day, glass phenolic based laminates are very good materials for many applications in electrical power systems equipment. These materials are covered by NEMA standards under NEMA Grade G-3. Our purpose in writing this paper is only to inform our customer base regarding common discrepancies in data from many suppliers in our industry that may result in less than ideal material selection decisions. When reviewing the material data sheet properties for any material, it is important to understand the terminology and test methods used to publish the indicated properties. Without industry accepted terminology or test methods indicated on the material data sheet, it is impossible to reliably consider the material properties in design. Unfortunately, many companies publish material properties with no industry accepted terminology or test method on which to base the material’s performance. There is tremendous risk in relying on property values of questionable origin. Speaking of origin, the problem is amplified with the proliferation of international vendors with little or no testing capability and no association with any internationally accepted standards. Buyers beware, material data may not be worth the paper it is printed on today.